Originally called AskJeeves, Ask.com is the fifth biggest search engine in the world which is built around answering people’s queries in the form of phrased questions. According to Ask president Doug Leeds, its 35 to 40 % search queries are in the form of questions, versus 6 to 9 % for other search engines. 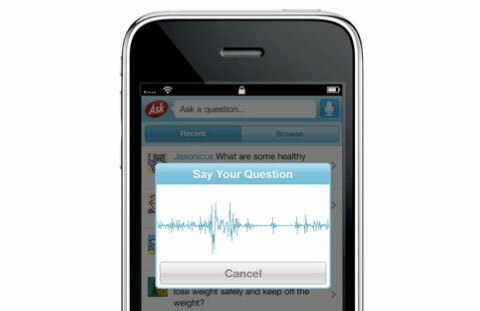 Now Ask is aiming to bring an official iPhone app with built in voice capability. Ask.com announced that it’s submitting the official app to Apple for approval and also provided some details about its unique functions. It was revealed that users will be automatically enrolled in Ask’s recently launched social Q&A beta when they download the app and will be able to ask questions either by typing or speaking them in to their iPhone. The app will translate the voice to text and will try to offer up the most likely answer right away, based on its index of more than 500 million questions and answer pairs from sources across the Web, including other Q&A sites, FAQ pages, and more. There is also an option to “Ask the Community” which directs your query to people in the social Q&A network who self-selected as being knowledgeable in related categories. Ask.com promised that before the end of the year the app will allow users to ask questions from their friends on Facebook and Twitter as well. A more important and interesting update to the app will be released with the second version of the app which will include a feature called “Nearby Answers”. The app will show a list of places based on the user’s location from which he/she can choose one and ask a question about it. The question can be about anything from a good restaurant or availability of seats at a nearby cinema. Your question will be routed to people nearby or people who have answered questions about those places in the past. You will also be able to see questions asked nearby, and adjust the distance from less than 1 mile to 50 miles using a slider. This is a great new handy app for solutions on the go and will further help in making places/location-based information the next craze for smartphone users.